A Malian ‘chemists’ shop – OUCH!!! It’s interesting to observe these places. Their artwork is not disimilar to the hairdressing salons (blogged about here). However, what they offer is quite different indeed. Treatment for ‘hemorroids’, ‘faiblesse sexuelle’, back ache and some kind of cyst. I’ve seen similar joints offering cures for malaria, asthma, even AIDS! Curious indeed! I love that this place’s name is ‘Resurrection’ – do they have medicines to raise the dead too?? At least it’s all 100% natural (and in 750ml doses)! Meanwhile, I think I’ll stick to a conventional pharmacy, wouldn’t you?? 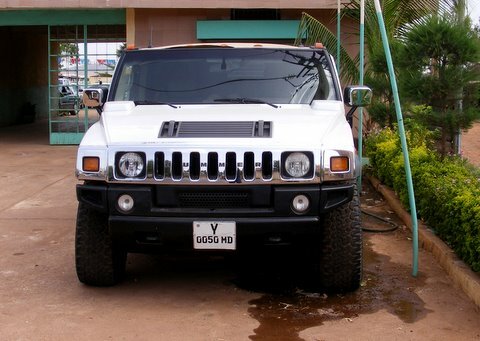 I remember seeing my first Hummer in West Africa a few years back – it was in Cotonou, Benin and was bright yellow. Then, a few months later, I saw a black one with tinted glass. For quite some time, these seemed to be the only two Hummers in the city. 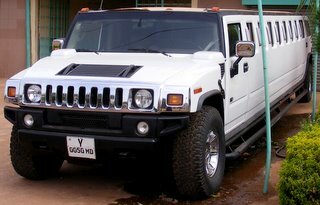 Since moving to Bamako, I’ve seen somewhere in the region of a dozen Hummers, so maybe there’s something in the saying “Where there’s muck, there’s brass”!! AMAZING! 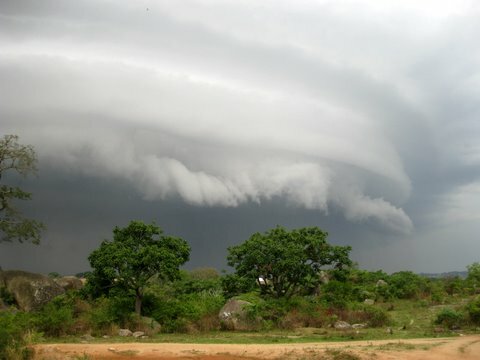 Who on earth is going to need – or even want – one of these here in Mali?! Presumably some rich folk with nothing better to do with their money! I’d like to see the window washing boys at the traffic lights tackle this baby! I looked up other stretch Hummers on line and found this one, almost the same length but with one long window. 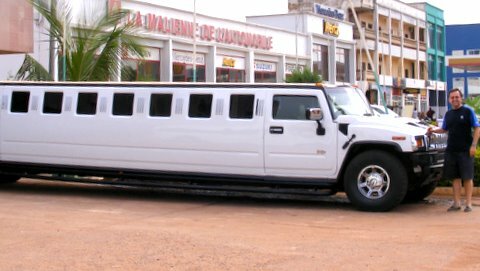 I also came across this humungous beast of a limo, which has three pairs of wheels at the rear! Insane, but I’d happily take a ride in one if I ever got the chance – wouldn’t you?!? Wow! Those are seriously three-dimentional, eh? The storm which followed put paid to our ‘scramble up the rocks’ which we’d planned for a Sunday afternoon. Not to worry – I think it was worth it for this photo! 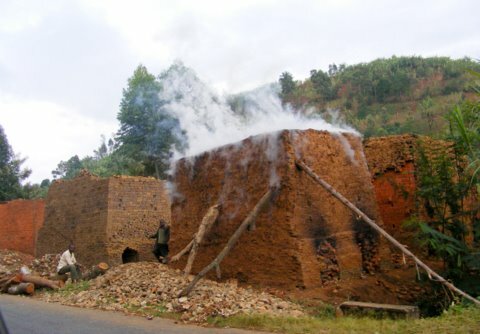 A brick kiln in Burundi. 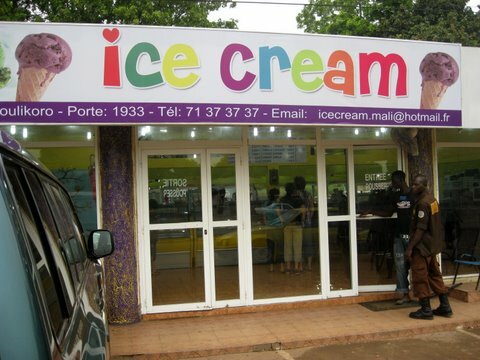 Yes, newly opened in Bamako, very close to the Fourmi supermarket and the bowling alley, is this icecream parlour. 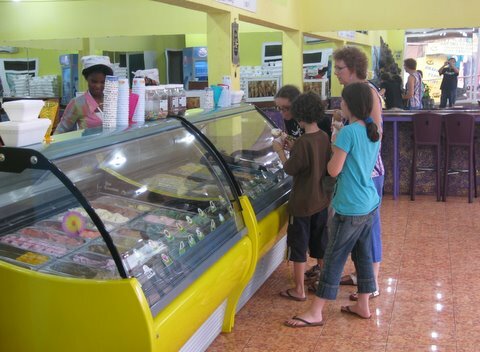 Here we are choosing our flavours (the place is nicely air-conditioned too, preventing premature melting of your icecream). Meanwhile the biggest drawback is the prices: no more than you’d pay in Europe, but still quite a lot compared with other places in town. 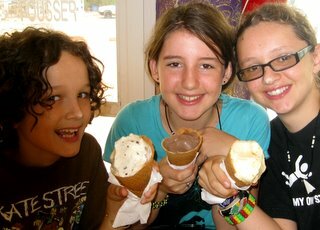 1000cfa for a cornet with one scoop is about £1.30 or $2 and if you have two scoops, it’s going to set you back £1.70 or $3! 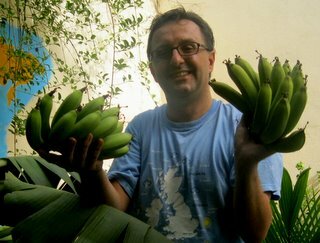 Now, bearing in mind my initial investment of £2.50 (or $4), we recently harvested no fewer than 163 bananas from the one plant! That’s 1.5 pence per banana!! Wow! 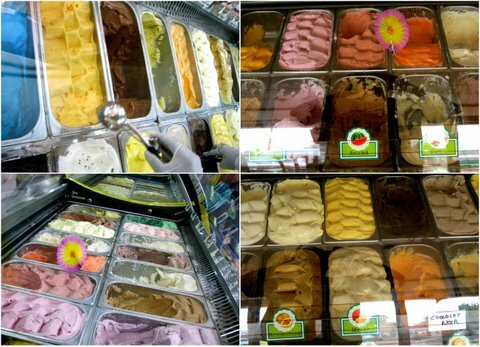 So, in the past couple of weeks, we’ve made banana icecream, banana cake, banoffee pie, banana chutney, bananas in chocolate…you name it. Just realized we haven’t done ‘banane flamée’ yet, but we still have a couple of dozen left for that. 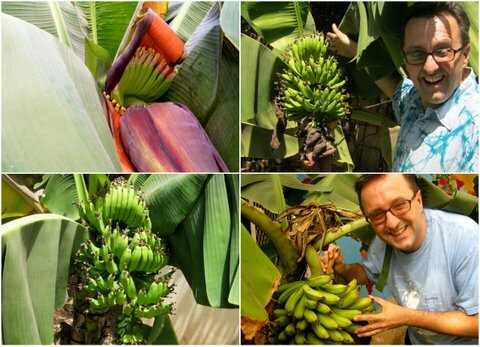 Want to know more about growing banans? 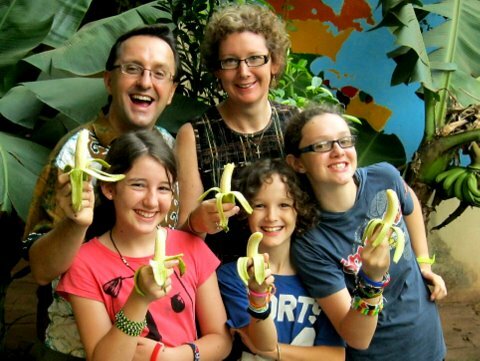 Then visit banana.com which also has a great recipe page here. 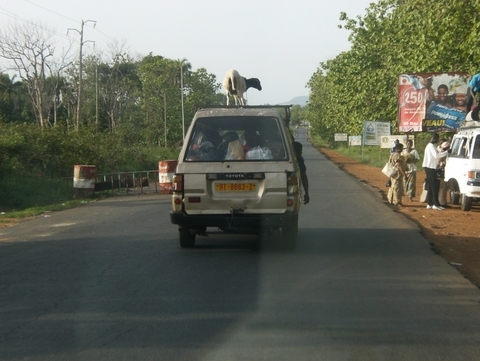 A goat doing a bit of ‘car-surfing’. Yeah – go goaty!